Containers are a way to package software in a format that can run isolated on a shared operating system. Unlike VMs, containers do not bundle a full operating system - only libraries and settings required to make the software work are needed. This makes for efficient, lightweight, self-contained systems and guarantees that software will always run the same, regardless of where it’s deployed. Docker lets developers bundle an app, together with services it depends on (like databases), into a runnable package called a container. Okay, maybe it needs a little more explanation than that. 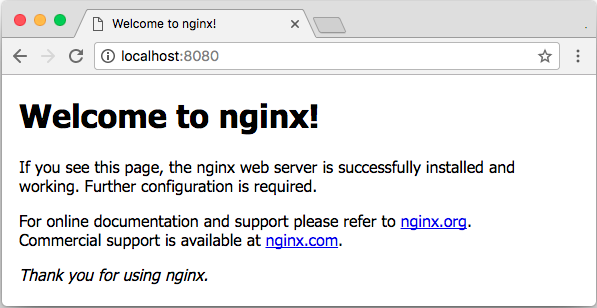 Let’s say I’ve been hearing about this cool web server called Nginx, and I’d like to try it out on my laptop. But I already have another web server installed, and I don’t want to interfere with that. So I install Docker instead. That’s coming from my new personal Nginx server, running on my laptop within a Docker container. If I press Ctrl-C in my terminal, the Docker container shuts down, and http://localhost:8080 no longer responds. It connects to a Docker registry, which is kind of like a GitHub for Docker packages. It downloads an image named nginx. An image is a file that Docker can base new containers off of. The nginx image includes a compressed Linux file system, into which Nginx has been pre-installed by the creators of the image. It launches a container based on the image. The container runs Nginx, which listens for requests on port 80. Nginx is listening on port 80 of the container, though. I need to publish that port to a port on my laptop’s OS. That’s why I added -p 8080:80 to the command: to publish port 80 of the container as port 8080 on my laptop. Typing http://localhost:8080 in my browser makes a connection to localhost, that is, my own laptop. The :8080 directs it to port 8080. Docker then forwards the request from port 8080 of my laptop to port 80 on the container. Nginx receives the request, and responds. Registries, which let users easily download images containing whatever software they need and the OS it runs on. Containers, which let you run the software you want, without interfering with software running on the host. Networking, which lets you connect to software running in a container. Docker will also let you run multiple containers on a host, and make virtual network connections between the containers. This one downloads and runs an image with a stripped-down Ubuntu Linux, then sets up an interactive terminal session on it (that’s the -it in the command). When it runs, you’ll be in an Ubuntu shell, working in a file system that’s totally separate from your actual computer’s. This one downloads an image that includes the Ruby programming language, and runs a small command-line script that prints the Ruby version. You don’t need Ruby installed on your system for this to work; Ruby runs from within the container. If Ruby’s not your thing, don’t worry, the link below has images for many other languages as well. This one’s just for fun. It runs XaoS, an awesome fractal viewer, which just happens to have an ASCII-art mode so it can run in your terminal. There are many key controls available, described here, but the “a” key turns on autopilot for moving around, the “y” key cycles through colors, and the “q” key quits. There are lots more cool images ready to go at https://hub.docker.com/explore/. If there’s a software package you’ve been wanting to try, but didn’t want the hassle of installing, see if it’s listed there!